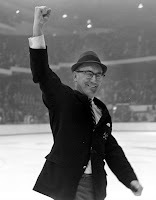 The Terrier Hockey Fan Blog: Jack Kelley: "The Mentor"
Before Jack Parker became the face of BU hockey, that position was held for ten seasons by another coaching legend, Jack Kelley. A former All-East defenseman for BU and team MVP in 1952, Kelley returned to his alma mater in 1962, and soon returned the Terriers to a spot among the elite of college hockey. His 206-80-8 record translates to a .714 winning percentage, the best of any BU coach. Kelley's decade behind the Terrier bench was capped by back-to-back NCAA championships in 1971 and 1972. He also was the driving force behind the construction of BU's first on-campus hockey rink, Walter Brown Arena. New recognition of Coach Kelley's many contributions to the Terrier program will take place this season on February 29 just prior to the game against UMass. A statue of “The Mentor” will be unveiled at Agganis Arena. Funding for the statue was raised entirely by former Terrier players, managers, and friends. We’ll post more details about this event as they become available and also will soon post a Q&A interview with Coach Kelley. A recent post about the recognition paid to longtime New England amateur scout Bob Crocker during the Dec. 1 game led to some critical feedback from several sources. As a result, we feel the need to make some clarifications. The post—which included an article from U.S. Hockey Report—incorrectly gave the impression that Coach Crocker was responsible for all Terrier recruiting during Jack Kelley’s tenure as BU head coach. While Bob was an integral part of the process of bringing talented players to Commonwealth Avenue, Coach Kelley led the effort, building upon the recruiting network and contacts—particularly in Canada, but also throughout New England—he developed initially when he was Colby College’s head coach. His keen eye for talent and matchless coaching skills enabled him to revive the Terrier program in just two years after taking the helm in 1962. One of Kelley’s top players at Colby, Ron Ryan, went on to coach at Penn, Merrimack, Colgate and the New England Whalers, before becoming an NHL executive. And Bob Crocker, who assisted Kelley at BU, coached at Penn and later was assistant GM of the Whalers, prior to his long career in scouting. Coach Kelley remains one of the legends of BU and college hockey. Following the 1971 and 1972 national titles, he stretched his championship streak to three seasons by leading the New England Whalers to the AVCO Cup title in the World Hockey Association’s first season.